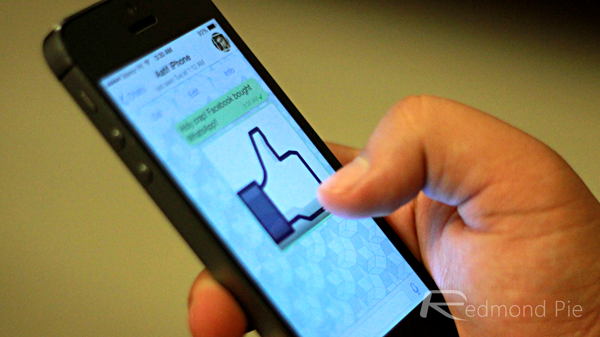 Brian Acton, co-founder of WhatsApp Messenger, is naturally among the headlines today after Facebook acquired the instant messaging service for the colossal sum of $19 billion. But what make’s Acton’s story particularly interesting is not just the mere fact that he, along with another former Yahoo employee, created perhaps the most high-profile service to be bought-out in tech history, but in an ironic twist, was rejected when applying for several jobs at major firms – including Facebook. See, while many have lauded the social network’s decision to grab WhatsApp – a service boasting around 400 million monthly active users – Zuckerberg could arguably have had WhatsApp for a great deal cheaper had he and his team recognized Acton’s potential back in August of 2009. Although Acton was well known within tech circles prior to this moment, the monumental amount of money paid out by Facebook for WhatsApp has thrust him into the spotlight, and as is often the case in these situations, interested parties have been doing some digging through his Twitter. 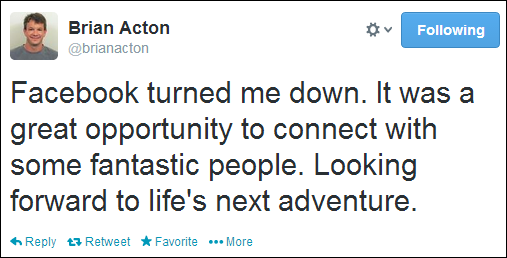 Along with the August 2009 revelation that he had been turned down by Facebook and thus, had missed out on “a great opportunity to connect with some fantastic people,” the determined Acton had also tried, and failed, to secure a job working for Twitter. Yet all of these rejections have proven to be a blessing in disguise for a guy who has now shown the entire tech world, including Facebook and Yahoo, what they’ve been missing. The story shows that, even when doors keep closing, determination and dedication can prevail, and considering WhatsApp was only launched five years ago, it’s staggering to consider how quickly nothing can be turned into a multi-billion dollar company. Of course, it’s easy to note of how Facebook may have missed a trick by not employing Acton sooner, a move to secure his services may have cheated the world of WhatsApp, which mightn’t ever been invented. In fact, had Zukerberg, or Twitter, or any other company, for that matter, had come in for him when he was job hunting, we’d hazard that WhatsApp almost certainly wouldn’t ever have materialized, so the constant rejection Acton faced has all worked out nicely in the end. For him, for Facebook, and, most importantly, for us.